Jeep’s Grand Cherokee was introduced as a premium mid-sized SUV in 1993, with its first introduction at the N. American International Auto Show at Cobo arena in Detroit. It is currently in its fourth generation configuration and has always featured unibody construction. The car is on a hot streak, being named a Consumer Digest “best buy” for the seventh consecutive year. Since 1999 Jeep Grand Cherokee annual sales have topped 200,000 on seven different occasions, including last year. And the 2017 4×4 Grand Cherokee such as I recently tested has been awarded a five-star overall safety rating from the National Highway Traffic Safety Association. My Grand Cherokee test vehicle for June was a Velvet Red Pearl Limited 4×4 that carried an M.S.R.P. of $46,680.00. I’m partial to red equipment and with the 18″ double ten-spoke gray wheels the Jeep was quite attractive. 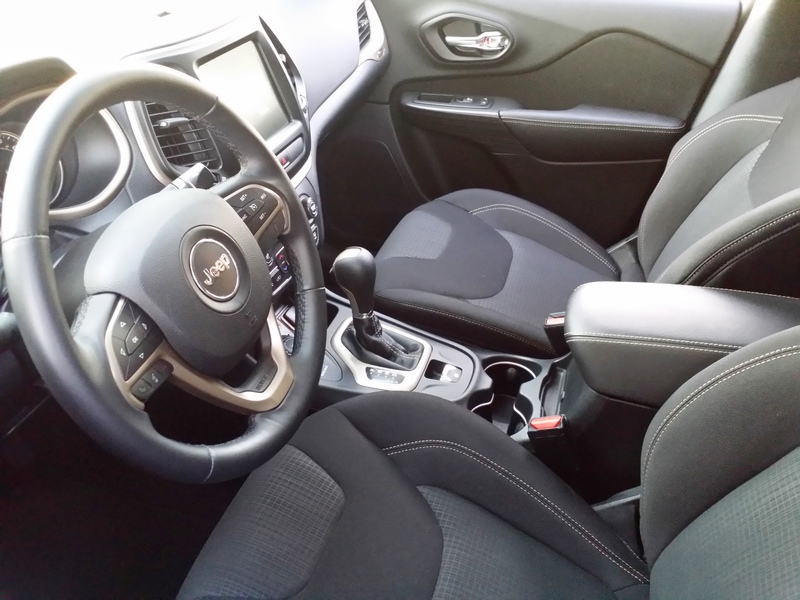 A black leather interior was on hand including heat in front and rear seats, 506-watt XM stereo, 8.4″ touchscreen display, dual-pane panoramic sunroof, navigation system, blind spot detection, power-tilt steering column, and 9 speakers with a subwoofer. The Grand Cherokee is a mid-sized SUV and seats five with cargo room in the rear of 36.3 cubic feet. If the second row seating is folded flat that number increases to 68.3 cubic feet. The Jeep wheelbase is 114.8″, length is 189.8″, and the weight is 4,677 lbs. The ride, interior noise suppression, handling and guidance on the highway are all on target and visibility is good, as well. When driving my test Jeep with Ruth, my wife, I often requested that she handle the gear shift when getting underway. At first I am sure she thought I was nuts, but what I wanted her to experience was the deluxe “feel” associated with the transmission control. It seems that the Jeep is definitely a “high touch”, and a “high utility” luxury SUV. I mentioned the wheels, and can add that tires mounted on them were Michelin Premier LTX 265/60R18 all-season radials. Of course the Jeep is a 4×4 with Quadra-Trac active on-demand system and electronic limited-slip differential. Select-Track options while driving include Track, Sport, Auto, Snow and Tow modes. Additionally, the Jeep had a trailer tow group of options with receiver hitch, wiring harness, etc. 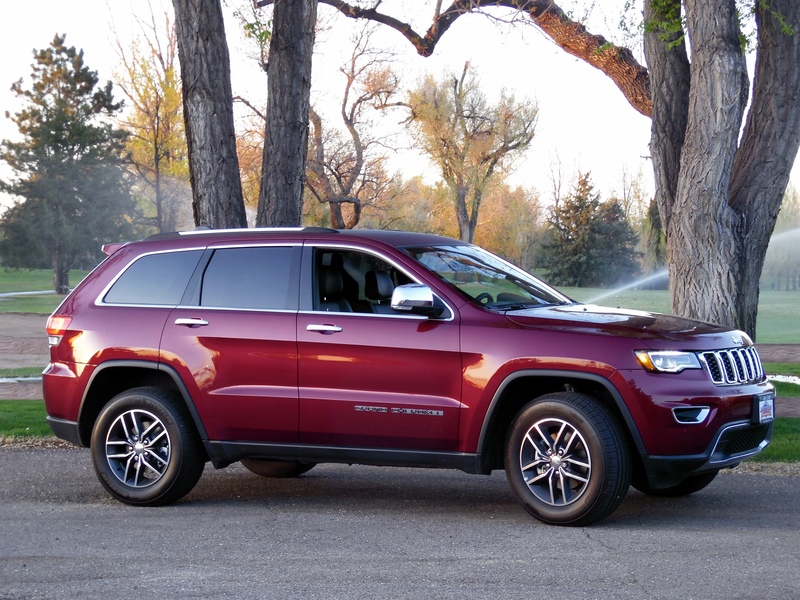 Power for the Grand Cherokee Limited is supplied by a 3.6 liter (220 c.i.d.) Pentastar 24-valve V-6 with 295 horsepower, 260 lb. ft. or torque, and stop-start technology. 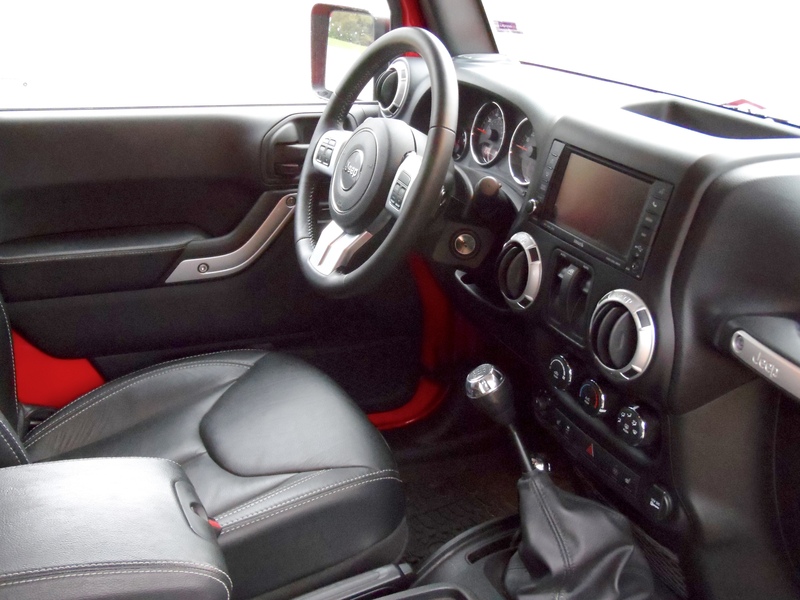 It is coupled to an eight-speed automatic transmission with, as Jeep describes it, a “Classic style” shifter. Economy ratings are 25 mpg-highway, 18 mpg-city, and 21 mpg-combined, and my observance was at 21.4 mpg during my time with the Jeep. It’s evident to me why the venerable Grand Cherokee has had such staying power for almost a quarter-century. 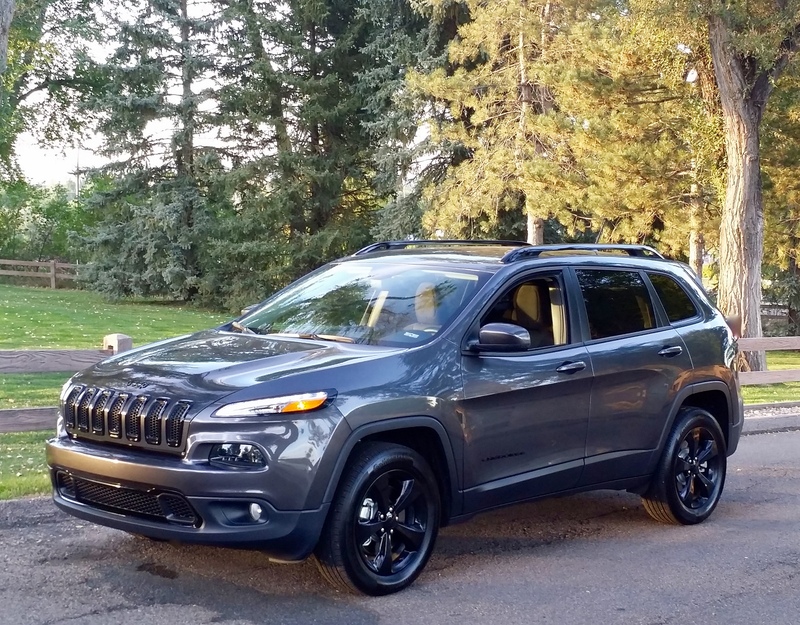 Recently I was chosen to examine the 2015 Cherokee Latitude 4 x 4 by Rocky Mountain Redline of Dacono, CO. They graciously brought the Jeep by my house and had a copy of the window sticker along – it was $33,825.00, including freight and several options. I’ll get into that list later, but at first glance I was surprised to see all of the black chrome trim work on the Jeep, and as the test unfolded a lot of my friends made favorable comments about the look. A gloss black appearance was featured on the grill, the window trim, roof rails, wheels, and the fascia application. Along with the Granite Crystal metallic clear coat paint, the vehicle therefore presented an aggressive, business-like look. The Ohio-built Jeep Cherokee is not to be confused with the Grand Cherokee – this is a mid-size crossover that was introduced for the 2014 model year and was co-developed by Chrysler and Fiat. It is 182″ long, 73.2″ wide, 65.7″ high, is mounted on a 106.3″ wheelbase, and has ground clearance of 8″. Weight of the model I drove was 4,044 lbs. As of this writing, it should not be driven on the streets of South Carolina, because it can only wade through 19″ of water. That’s actually pretty good, but the weather in SC is pretty bad. 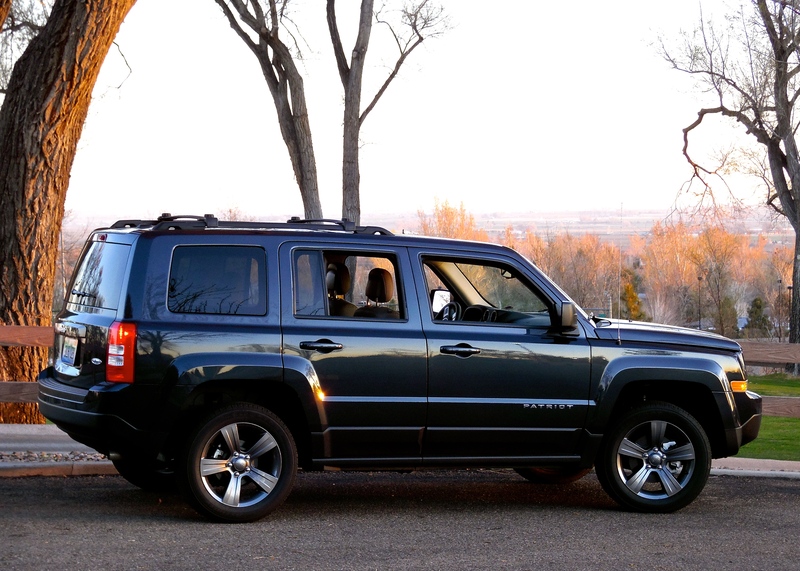 I enjoyed testing the Jeep in Colorado, and was pleased about the extra punch provided by the 3.2 liter (197.7 c.i.d.) Pentastar V-6 with 271 horsepower at 6,500 rpm. The torque rating is 239 lb. ft. at 4,400 rpm. Smooth acceleration was effected through the single-speed Activ Drive I four-wheel drive system and the new 9-speed, Chrysler-built transmission that adds economy to the Jeep’s EPA ratings – they are 28-highway, 20-city, and 23-combined miles per gallon. My reading came in as expected and just a little above the combined figure. For the four-wheel drive system, a floor dial is on hand with up to five traction control settings. They are auto, snow, sport, sand/mud, and rock, and the management system is referred to as Selec-Terrain. The loaded Jeep Cherokee Latitude has as options the following items: customer preferred package ($600.00) – 18″ x 7″ gloss black five-spoke wheels, black trim work and P225/60R18 Continental ProContact steel radials; safety tech group ($1,045.00) – blind spot monitor, rear park assist and multi-function power mirrors; comfort/convenience group ($1,745.00) – remote starter, power lift gate, remote entry and go, power cloth buckets and XM satellite radio; V-6 engine ($1,745.00) – includes start/stop feature for economy plus dual exhausts ; UConnect ($600.00) – 8.4 infotainment screen with navigation capability. All the items were in addition to a base price of $27,095.00 and a freight charge of $995.00. 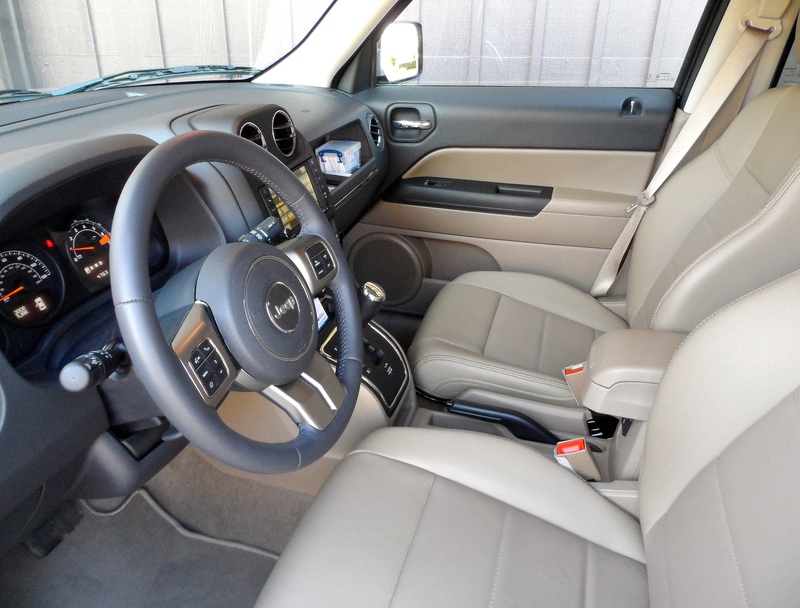 The total Jeep package was impressive, with V-6 power in an advanced power train, deluxe interior with room for five people plus 25 cubic feet of cargo, acceptable fuel economy and list price, and all the amenities except leather and moon roof. In other words, everything that you expect in a Jeep, and have since 1941. Jeep has been building off-road and sport utility vehicles since 1941 (civilian vehicles since 1945), making it the country’s oldest SUV brand. They were originally provided for the U. S. military during World War II, specifically light 4-wheel drives for the Army. Willys-Overland, the manufacturer of Jeeps, provided about 640,000 units for the war effort, and the initial contract price was $648.00 each. Thousands of Jeeps were left behind in the Philippines after the Allied victory over the Japanese, and most were converted to taxis and became the primary mode of public transportation there. Called Jeepneys (Jeep/jitney), they were also my primary mode of transportation beyond the gate at Clark AFB while I served there in 1970. Up front, each Jeepney had a driver and a conductor, who managed passengers and collected fares. Air Force GI’s rode in them to their favorite bar for about 20 cents. Jeep, now owned by Fiat Chrysler Automobiles, LLC, has sold the Wrangler since 1987, and the compact SUV is now in its 4th generation configuration. 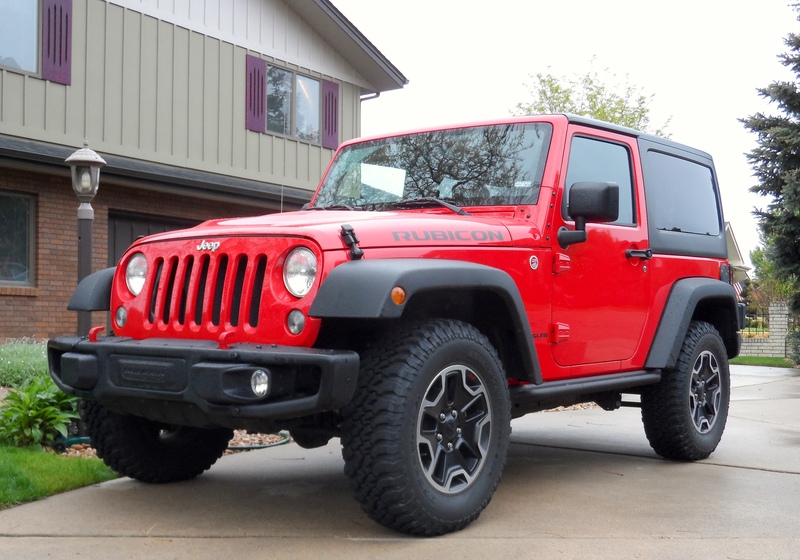 Since 2007 it has been available in a 4-door “Unlimited” model with an additional 20.6” of wheelbase, but my latest test vehicle was the Wrangler Rubicon 4×4 Hard Rock two-door Although much evolved, the Wrangler remains a knockoff of the original Army Jeep of the 1940’s. My test Wrangler was good-looking Firecracker red clear coat paint outside with black leather seating and front buckets that were heated. M.S.R.P. 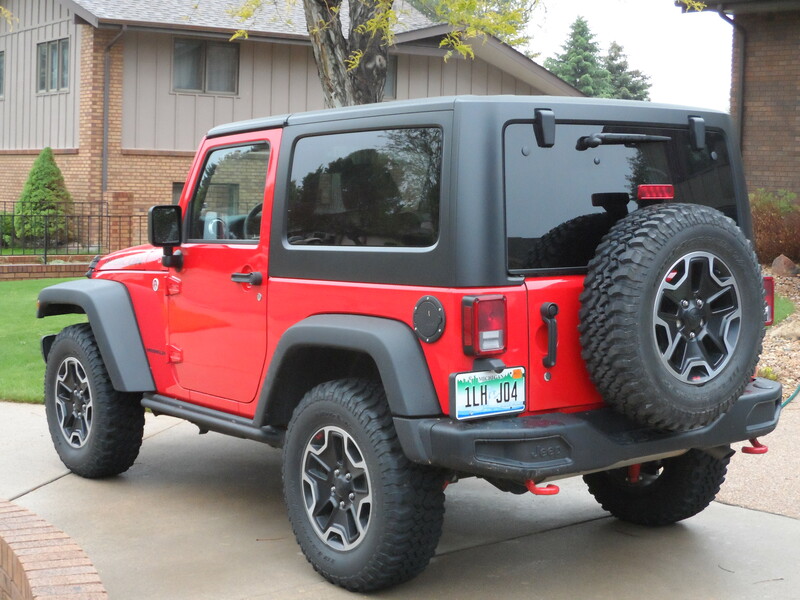 for the Jeep was $39,255.00 and included the base price, freight, connectivity group ($1,570.00), 3-piece hard top/soft top ($595.00), and Hard Rock convenience package ($4,500.00). The Hard Rock package included power locks/windows, cruise, tilt, XM radio, fold-down 3 passenger rear seat, and Bluetooth connectivity. Cargo capacity is 55 cubic feet with the back seat folded and 12.8 cubic feet with it erect. A nice feature of this year’s Wrangler is the new 3.6 liter Pentastar V-6 with 285 (@6,350 rpm) horsepower and 260 (@ 4,200 rpm) ft. lb. of torque. Along with the 6-speed manual transmission, it provided me with enough power and can go zero to 60 in 8.5 seconds. Gas mileage ratings are 17/21, city and highway, 18 combined and my observation was 18.8 mpg for the week. Ride and guidance on the road with the Jeep is better than can be expected and wind noise is acceptable. Off-road capability is exemplary, of course, with 2-speed transfer case, ample ground clearance, and the limited-slip differential. I mentioned the paint – also, the Jeep had 17” polished semi-gloss black 5-hole alloy wheels, BF Goodrich Mud-Terrain T/A, LT255/75R17 black-letter tires, fog lights, iconic seven-slot grill, and front tow hooks on the bumper. When the Rubicon arrived, I was extremely excited to run around with it. Not being a hunter or fisherman, however, I suppose ownership of such a car would be inadvisable for me. For those that want it for those activities, I strongly suggest they take a look at buying one of these Jeeps.